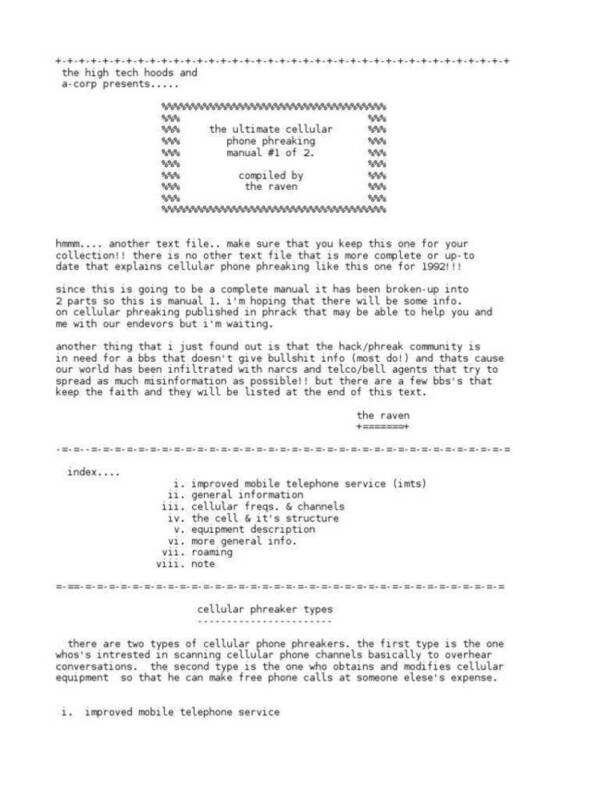 Basic phreaking and telephony text file. DIAL KP + 2130801050 + ST FOR THE ALLIANCE TELECONFERENCING SYSTEM IN LA." BE SENT TO A TOLL OFFICE (CLASS 4 OR HIGHER -- SEE TELCOM IV) TO BE PROCESSED. AGAIN SENT TO SIGNIFY A DISCONNECT TO THE DISTANT END. (*) USED ONLY ON CCITT SYSTEM 5 FOR SPECIAL INTERNATIONAL CALLING. USAGE. THESE UNITS WERE INSTALLED IN CO'S WHERE MAJOR TOLL FRAUD EXISTED. ACTUALLY COMMITTED. OVER 200 CONVICTIONS RESULTED FROM THE PROJECT. THOSE THAT THEY CATCH ARE BUSINESSMEN. PHREAK; AND MARK BERNAY, ONE OF THE NATION'S FIRST AND OLDEST PHREAKS. THAT THIS CAME FROM ANOTHER OFFICE AND IT WILL HAPPILY PROCESS THE CALL. CO EQUIPMENT SIMPLY RECORDS THAT HE HUNG UP ON A FREE CALL. DIRECTLY INTO TRUNKS THUS AVOIDING THE NEED FOR 2600 HZ AND DETECTION! CAN BE AVOIDED BY MAKING SHORT-HAUL (AKA LOCAL) CALLS TO BOX OFF OF. ANSWER SUPERVISION. THUS THE CALLS WERE NOT RECORDED ON THE AMA/CAMA TAPES. AT&T CHANGED THIS THOUGH FOR "TRAFFIC STUDIES!" CCIS, ONE MUST FIND A DIRECTORY ASSISTANCE OFFICE THAT DOESN'T HAVE CCIS YET. NUMBERS TERMINATING IN NON-CCIS CITIES ARE ALSO GOOD PROSPECTS.
" TO THE 2600 HZ TONE. VIRTUALLY PURE 2600 HZ TONE IS REQUIRED FOR DISCONNECT. HIT) BUT IT SHOULD MAKE IT PAST THE LOCAL CO AND THUS THE FRAUD DETECTORS. THE SCOPE OF THIS TUTORIAL, IT IS WORTHWHILE TO MENTION SOME OF THE DETAILS. TEN COMMANDMENTS (AS INTERPRETED FOR PHREAKS BY FRED STEINBECK -- TAP #86). CAN THEN BE USED AT A FORTRESS. THAT I WILL OUTLINE BELOW FOR THE ELECTRONICS HOBBYIST. 555'S IN ONE CHIP). IT OFFERS EXCELLENT FREQUENCY AND VOLTAGE STABILITY. INSTEAD. SCHEMATICS FOR THIS TYPE OF BOX CAN BE FOUND IN TAP ISSUE #29. SCHEMATICS FOR THIS TYPE OF BLUE BOX CAN BE FOUND IN TAP #26. BOTH DESIGNS DRAW ABOUT 20 MA OF CURRENT. USUALLY, THE HARDEST PART ABOUT BUILDING A BLUE BOX IS THE CALIBRATION. A FREQUENCY COUNTER IS A MUST AND AN OSCILLOSCOPE WON'T HURT. AREN'T, THEY ARE PROBABLY FROM A BLUE BOX AND A TROUBLE CARD MAY BE DROPPED. HIGHER SPEEDS AND DOESN'T NEED INTERDIGIT INTERVALS. WILL DO VIRTUALLY ANYTHING FOR YOU PROVIDING IT IS WITHIN HER NPA. NUMBER WILL GET YOU MIAMI. USUALLY, THE INWARD OPERATOR FOR AN AREA IS SIMPLY KP + NPA + 121 + ST. EXAMPLE, THE R&R OPERATOR WILL RESPOND WITH "WHITE PLAINS, NY." YOURSELF TO AN INTERNATIONAL SENDER AND KP + 04419863611 + ST. PLEASE" AND GET "COUNTRY CODE 61 PLUS 2." WITH "COUNTRY CODE 44 PLUS 121." COMPLETING A CALL TO (CALLED PARTY) AT (CALLED NUMBER)." THE COUNTRY CODE. THIS WILL ROUTE YOU TO THE APPROPRIATE OVERSEAS SENDER. CODE + LOCAL NUMBER + ST AND THE CALL IS ON ITS WAY. NECESSARY. FOR EXAMPLE, ENGLAND, COUNTRY CODE 44, BECOMES 044. ADDED WHEN NEEDED IN MOST CASES. THE 11XXX SERIES IS INTERESTING SCANNING MATERIAL. THAT YOU PULSED IF THEY ARE OF THE RIGHT FREQUENCY. THREE DIGIT CODES IN YOUR AREA (I.E., KP + 000 + ST, KP + 001 + ST, ETC.). COIN RETURN. THUS EVERY BLUE BOX IS ALSO A GREEN BOX (SEE TELCOM VI). This phile was passed through Damage, Inc.